As mortgage loan originations have slowly begun to increase, the focus for this coming year will be more on streamlining the mortgage loan process. With the well of borrowers in need of refinancing beginning to run dry, mortgage lenders will be forced to focus more of their energy on purchases. Purchases are more time consuming transactions that will force lenders to ramp up the scalability of their organizations in order to stay profitable. Closing will need to be quicker and more accurate even with the endless documentation that is required. According to an article in National Mortgage News written by Rajesh Bhat, technology is predicted to play a big role in assisting lenders with this new landscape in 2015. With the digitization of the consumer experience, mortgage lending will continue in the direction of becoming paperless. With the never ending disclosures required by regulation, the current process can easily take an excessive amount of time. The technology to deposit an image of a check is starting to be utilized by the mortgage industry in digitally sending signed documents which changes the face of online mortgage applications. There is even technology available that will automatically recognize and sort the documentation once received. Relaxed lending standards aimed at the first time homebuyer will see more millennials becoming homeowners. 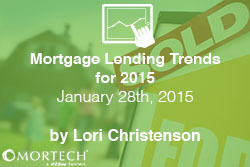 Lenders will need to utilize new technology that is becoming available in order to appeal to this demographic. Forward-thinking lenders willing to embrace technological advances will thrive within this environment now and in the future. To find out more about some of the technology that Mortech can offer you and your business, click here. Or, to find out how you can increase your web presence to prepare for the oncoming Millennials, check out our mortgage websites.